Momentum is stocks tendency to move in the direction of prevalent trend. You can use momentum to select stocks to swing trade or position trade. Momentum can be calculated in many ways and the period and specific method used to calculate momentum depends on your goals and holding periods. Momentum is often used to rank stocks and then top 25 or top 50 or top 200 stocks are selected for swing or position trades. This kind of momentum is relative momentum or relative strength. Momentum can also be used to identify when a stock has entered momentum phase and when the momentum has ended. This kind of momentum is called absolute momentum. Momentum based trading strategies have big advantage as they allow you to put your money to work in fastest moving stocks. The momentum scans shared here can help you find momentum stocks on your own and profit from them. In Telechart you can create a layout with multiple momentum sort criteria. This kind of momentum sort allows you to rank stocks by momentum quickly. This is six month momentum ranking sort. It is useful for intermediate term hold and long term hold. This is 3 month momentum ranking sort criteria. It is good for finding swing trades opportunities. If you know how to use it profitably you can find thousands of trades in a year. This is one month price percent change ranking. Short term momentum often mean reverts so this can be used to find extreme momentum moves vulnerable to reversal and you can fade them. It can also be used to find consolidations or pullbacks on recent big breakouts. This is one 10 day price percent change ranking. Short term momentum often mean reverts so this can be used to find extreme momentum moves vulnerable to reversal and you can fade them. It can also be used to find consolidations or pullbacks on recent big breakouts. This is one 5 day price percent change ranking. Short term momentum often mean reverts so this can be used to find extreme momentum moves vulnerable to reversal and you can fade them. It can also be used to find consolidations or pullbacks on recent big breakouts. Longer duration momentum moves can be used to find position trades. 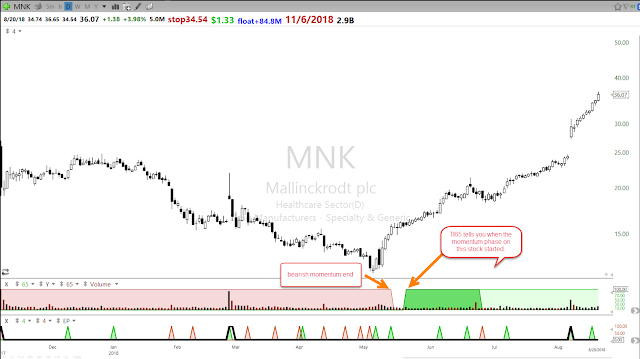 A stock with long term momentum can often spend months forming a base near top of its range , such stocks on high volume breakouts can go on to make further big moves. DT (Double Trouble) momentum sort is anchored momentum sort. It is based on the Darvas and Richard Love books . Itcalculates momentum from 52 week low. This kind of momentum is good for finding longer duration swing trades. This is a 42 days momentum sort. It is used for mutual funds in 401k investing. All above scans are for ranking stocks. But many of these momentum indicators can also be used as absolute momentum indicator. The advantage of that is , it tells you when a stock has entered momentum phase. Above chart shows TI65 Momentum used as absolute momentum . The Pink period indicates stock was in downtrend and when the downside momentum started and ended. Green portion tells you when the bullish momentum started. Absolute momentum is good for signalling trend transitions . The signal depends on period you use. If you are aggressive trader using faster signal will get you in early. Longer period momentum of 6 month is slower in identifying trend transitions but can help you avoid whipsaws. 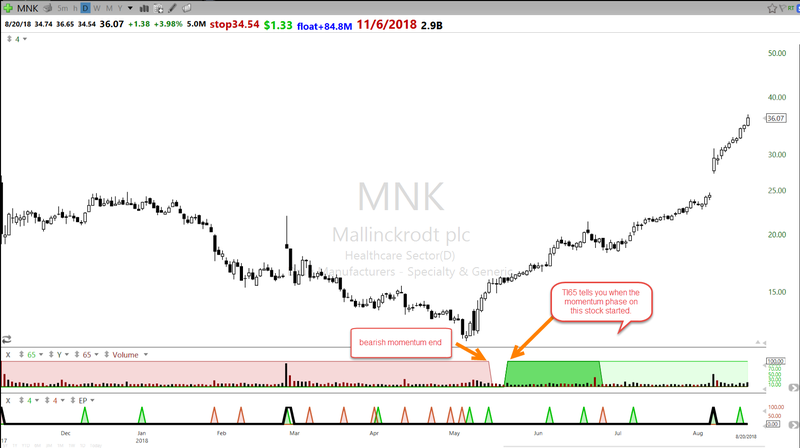 Same MNK chart with MDT as absolute momentum indicator will show you that. Once you understand momentum and nuances of using momentum you can find many creative uses to momentum. If you are serious about making money trading learn about momentum and how to use it to extract money from the market. Once you learn the details of momentum it is life long money extraction tool.